Brisbane Lions' players have set the lofty goal of qualifying for finals in 2019, with coach Chris Fagan admitting such an aim would have been unrealistic even a year ago. 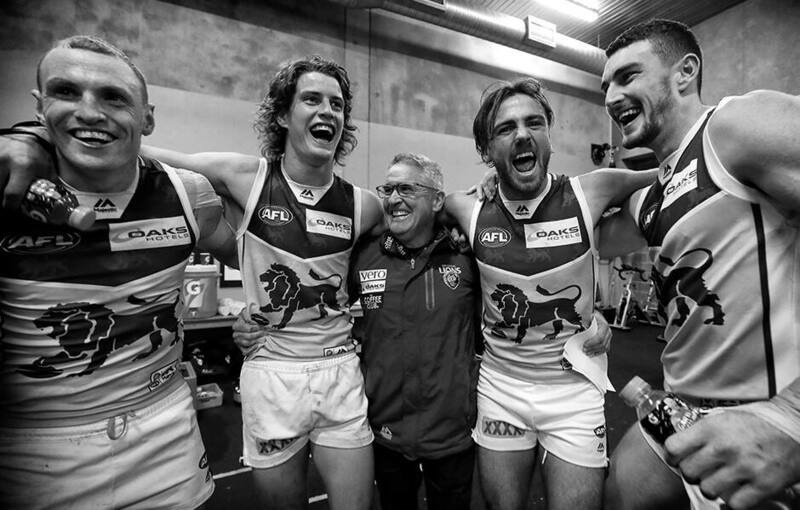 The Lions won five games last year for the second straight season under Fagan, but it was met with far more positive reviews – and the club's cavalcade of talented cubs seem primed to roar. They would have posted nine victories if they reversed their 1-5 record in matches decided inside 10 points. The Lions added Lachie Neale, Jarryd Lyons, Marcus Adams and Lincoln McCarthy in the off-season, while former captain Dayne Beams was the sole best-22 departure, albeit a significant one. The Lions last contested a final a decade ago, in the first of Michael Voss' almost five years at the helm. "No, it wasn't (a goal to make the top eight last year). It wasn't realistic," Fagan told AFL.com.au. "It probably seems a little strange to say that a team that won five games last year believes they can push for finals, but there were so many of those games that we lost by not much. "They know they're close – and much closer than they were the year before. "So with the guys we've been able to bring into the Club, with the continued development of our really good young talent, their belief is they can push for (finals). "It's no good me telling them. It's more important they think they can." Brisbane's percentage spiked from 74.31 per cent to 89.07 last season, while its average losing margin dropped from 47 points to 25. The Lions also made major, and necessary, inroads in key statistics such as contested possession, clearances and time in forward half differential, as well as points from stoppages. The logical next step is to actually win more matches, with Fagan saying he would be "disappointed" if Brisbane failed to increase its tally from last year. "In a way, you've got to fail your way to the top," he said. "You've got to set your goals high and stretch yourself, and sometimes you're not going to get there, but in trying to get there, you learn a lot about yourself and that enables you to improve. "We very much have that growth mindset at our footy club and we know it's not going to be smooth sailing and a direct line, but as we saw last year, we improved in so many ways." Ex-Bulldog Adams gives Brisbane greater depth in its tall defensive stocks, while young bucks Cedric Cox and Zac Bailey are being trialled at half-back to provide more of an attacking dimension. However, one of the critical factors in the Lions' potential climb could be how capably Dan McStay can serve as their go-to target in attack while Eric Hipwood grows into his slight frame. "Hippy's' not physically big enough (to be that player for us yet). What he is, is a great athlete, and he runs," Fagan said. "We need the Dan McStays and guys like him to play that pillar sort of role up there, where the ball gets kicked on their head and they make a fierce contest and occasionally take a mark – and importantly don't get outmarked. "He's at an age now where he has to shoulder that responsibility, but we've also got to find and develop others who can play similar roles. Dan McStay points towards Eric Hipwood during a match in 2018. "Some of those guys, like Connor Ballenden and Tom Fullarton, are in the ranks, but they're still young." Fagan's cautious confidence about his side stems not only from the obvious improvement in 2018, but also what he has witnessed from his players this pre-season. "We haven't played a game against opposition, so I have to be careful," he said. "But I'm really thrilled with what I see, in terms of their professionalism, the way they train, and their mateship. There's a great brotherhood growing at Brisbane. "The way they turned up to pre-season, the shape they were in, the way they turned up after Christmas, the shape they were in – they're all just little signs they're on a mission and that they have belief. "I think that's taken a little while to develop."